It happens to everyone at some point – your body is simply not as good at getting around as it used to be. This doesn’t mean that you have to give up walking around or resort to a wheelchair. No, all you need to ease your movement is a walking cane. With the right cane in hand, you will be able to get around with even less assistance than before! Of course, much like everything else, it is not a case of one cane fits all. You will need to discover the walking cane that is best suited your needs. Everyone has their own set of challenges and the compatible cane will help to ease these issues. This is a guide to helping you make the right decision for your circumstances. Go through all of the information that has been provided here to decide the best walking canes for you. Being told that you require a walking cane is not something that many people want to hear. After spending most of your life walking around all on your own, it can seem quite unnecessary. Furthermore, you may even feel embarrassed to amble around in public like that. Nevertheless, walking canes are quite useful. For instance, a cane can help to take the pressure typically placed on your back, hips, or knees while walking. Instead, some of this weight is displaced to the arms as well as the walking cane itself. This way, the joints on your body and your back experience less wear and tear. This can lead to diminished discomfort and injury. If you are having a difficult time maintaining your balance, a cane come in handy here as well. This is because by reducing the stress on certain parts of your body, you are actually conserving energy. This energy is then directed towards helping you keep your balance. Also, the cane itself helps you from slipping and falling. If you were anything like me at all, you probably never thought twice about walking canes until you needed to actually go out and buy one. It is only after you were forced into taking action did you probably realize just how much there is to learn about this topic. First things first, let’s take a look at the actual structure of a walking cane. At the very top of the walking cane, you will find the handle. This will come in various designs and will also be made of several different substances. The designs may be for style purposes or to improve the overall comfort of the walking cane. Next, is the cane shaft. This, too, can be made from a variety of materials, depending on your specific needs. Last but not least, is the cane tip. This comes in an array of styles, once more provisional to what you need your walking cane to provide for you. Standard Crook Cane: this is one of the most popular designs available. One of the benefits of this cane is that it allows the user to grip the cane more comfortably. This way, there is less tension on the hands, particularly if you use the cane on a regular basis. Aluminum Standard Cane: the difference with this cane is that it is made of aluminum and that the handle is more curved. The material of the cane makes it ideal for being able to take up to 250 pounds in weight. The added curvature of the handle also provides greater comfort for you. Offset Cane: an offset cane has a specially shaped handle. The specific angle of the handle allows taking some of the pressure off of the wrist. As such, it is best suited to individuals who have wrist problems or unable to grip their canes well. 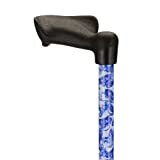 Orthopedic Grip Cane: as the name implies, the grip on the handle of the cane is quite unique. The design of the handle makes it so the pressure is evenly distributed across the palm. This way, there is less stress placed on your wrist. Quad Cane: this cane ends in a four post base. This feature provides extra stability for you. Due to this increased steadiness, this is a cane that is typically assigned to bariatric patients. This is perhaps one of the best walking canes for balance. There are three main things to consider when buying a walking cane. First, it needs to serve its purposes. This means that the cane in question should be able to assist you adequately as you walk. It should offer the necessary stability to ensure that you are not putting any unnecessary weight on your own body. The second thing that your cane should do is to assure a certain comfort level, particularly with your hand and wrist. Your wrist should not have to bear the brunt of your whole body by itself. Finally, your walking cane needs to be a safe piece of equipment. Much like choosing superior clothes or shoes, you should often consider the brand of a walking cane. This is because there are some companies who are well-equipped at making these canes. Not only do they consist of excellent craftsmanship but they also design the canes to ensure that they serve a specific purpose. Of course, while good brands are important, you do need to be able to afford the walking cane that you wish to buy. However, remember that it is better to invest in a good cane rather than buy a cheap one and have to replace it quite often. The need for a comfortable and adequate grip has also been discussed. Similarly, however, the height of the shaft is also quite important. The length of the cane can severely impact whether the cane is being effective or not. This is why you should get fitted to determine just how long the shaft should be. If you cannot get one that is tailored, at the very least, you should purchase a cane that can be adjusted. With a cane that has adjustable height settings, you will be able to fix it to a height that is suited to you. Another thing that you should contemplate is the material of the cane. This is for many reasons. First, the material that is used will determine the durability of the cane. If you are going to use it frequently or will head through rough terrain, you are going to require something that is a little tougher. Furthermore, the material will also conclude just how heavy the cane will be. After all, you will require one that is neither too light nor too heavy for you to carry. Finally, the material will also govern just how much weight that the cane can take. If you are a larger physique, you may need a stronger substance. While these are the most vital factors for choosing the best walking canes, there are several others to consider. One of these includes whether or not the tip and the handle are fitted with a shock absorbing material. This will greatly help alleviate the pressure that is placed on your wrist as well as the rest of your body. Also, you may want to consider a foldable cane. These can come in quite useful when you are traveling. Once you are seated, you can simply fold the cane up. Also, these types of canes take up less space than traditional ones. These days, walking canes are also equipped with certain added technologies. For instance, you can get ones that have flashlights attached. This will help to illuminate the way when you are walking in a poorly lit area. In addition, some canes also have warning lights. This helps to warn cyclists and motorists that there of your presence. Lastly, you can get a warning element on the cane. This will emit a high pitched noise alerting those nearby that you require assistance. You should also remember that these sticks are not just walking canes for seniors or for the injured. A walking stick can have other purposes as well. For instance, there are many people who prefer this type of assistance as they can also use walking canes for self-defense. Therefore, regardless of your circumstance, you may want to consider having such an addition by your side. There are some walking canes that fold up either in two or more parts, depending on the design. This is a feature that you may want to consider. For instance, folding canes offer a great deal of versatility. This means that you can take them with you as you are traveling. Once you have used the cane, you can simply fold it up and put it away on a plane, train, or car. This is also a good option if you do not have much room in your home or are not planning to use the cane too often. You will be able to find many foldable canes Amazon. If you are a man, you may be considering a particular type of walking cane. First, you will need to ensure that the cane can support your height. This is especially important if you are unusually tall or have an especially large physique. You will need to find a walking cane that can be adjusted to your height with ease. Furthermore, you will need to find a particular style as well. Pay close attention to the handle of the cane if you are trying to find that is as distinguished as it is useful. If you are looking for canes for women, you too will need to find one that is suited to your height. This often means making sure that the height adjustments are available to you if you are a little shorter. A good way to go is to focus on canes that cater to those who have smaller physiques. Remember that a good fitting cane is one of the most important factors. What most people are usually worried about with walking canes is that they will look old or clinical carrying one of these sticks around. Thankfully, there have been great strides made in this particular department. You can now find fashion canes and walking sticks to match both your personal style as well as your physical needs. If you wish, you can find many different walking canes that are reminiscent of a bygone era. You will be able to find antique styles, such as the knob handle. These typically consist of metal handles with intricate carvings. In certain instances, they may even contain stones. You can even get handles that have been carved into animal features. These are usually not advised for frequent use. Nonetheless, they are great novelties to be brought for a special event or occasion. Of course, the handle is not the only place that decoration can occur. There are many hand carved versions that have whittled pretty designs into the shaft. You can also choose a variety of wood or imitation wood to get the exact look that you would like to replicate. Sometimes, these canes may be not suited to you if you have an injury. Under these circumstances, you require more stability and balance. This does not mean that you have to give up on style, however. Even the most orthopedic cane, will often have many choices in color and patterns. Last but certainly not least is your own preferences. This includes material, feel, and even style. If you are going to be using the cane day in and day out, on a regular basis, you need to like it. Luckily, there are also plenty of fashionable canes as well. These come in different designs and colors to help brighten up your whole look. You will also be able to find designer walking canes for women and ones that are specifically walking canes for men. The HurryCane the Freedom Edition, weighs around 1.3 pounds and can be adjusted from 30.5 inches to 37.5 inches. There are eight different height adjustment options. The HurryCane ends in a SteadiGrip base, a three-pointed base. The handle is ergonomic and the cane can be folded. The HurryCane can take up to 350 pounds of pressure. The reason that the HurryCane has the number one spot is because it is incredibly versatile. This cane claims to be all-terrain and it lives up to these claims well. 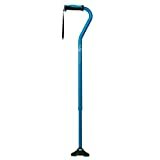 You can confidently go for walks with this cane over some rough and uneven ground. This is thanks to the SteadiGrip that allows for better displacement and balance. In addition, the cane can also be adjusted to many different heights and can be easily stored. Many people have reported this cane being unable to stand by itself. Therefore, if you have issues with kneeling or picking up items, the HurryCane may not be your best option. The Hugo Mobility Quadpod consists of an aluminum frame. The cane weighs about 1.4 pounds and stands at 28.5 inches. It has 12 different height settings and is capable of supporting individuals of heights between 5 feet and 6’5. The cane is also able to support up to 300 pounds in weight. The handle of the cane is both shock absorbent as well as ergonomic. There are several interesting aspects of the Hugo Mobility Quadpod that make it suitable for this coveted spot. First, although it is technically a quad cane, the base is much smaller than the typical quad cane. Not only does this make the overall cane much lighter, but it also helps to make the cane more stable. Furthermore, the Quadpod can accommodate individuals of a large range of both heights and weights which make it one of the most flexible canes on the market. This cane also comes equipped with an offset handle. This increases the comfort level as well as its ability to disperse pressure from the wrist. The only downside to the Quadpod would be the fact that you cannot fold it. While this feature would have been greatly appreciated, it is still one of the best walking canes around. 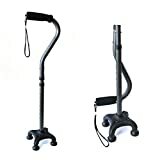 The HealthSmart Walking Cane is definitely one of the prettier options, making them excellent walking canes for ladies. The cane can be adjusted from 33 inches to 37 inches and weighs about half a pound. The handle is made from a gel-like substance and the tip of the cane is slip-resistant. The cane also is folded into four sections. 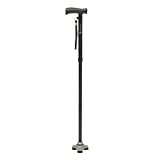 The HealthSmart cane is capable of supporting up to 250 pounds in weight. There are many benefits to purchasing the HealthSmart Cane. For starters, it is incredibly safe thanks to the slip-resistant tip. This way, you can ensure that you will not slip and fall while depending on this stick. Furthermore, the cane can be adjusted to different heights, making it suitable for a variety of people. Finally, this cane can be taken with you wherever you go as it can easily be folded up to make it more compact. One of the disadvantages of the HealthSmart is that there are limitations to the height adjustments. As such, if you are quite short, this cane may not be tailored to your height needs. The Hugo Adjustable Quad Cane is made from aluminum and weighs 2.1 pounds. The cane is 29.2 inches in height and ends in a full quad tip. The cushion-top handle is ergonomic and also has shock absorbing capabilities. The Adjustable Quad cane has eleven different height options and is suitable for individuals between the height of 5.0 and 6.5 feet. It can also support 300 pounds in weight. The Hugo Adjustable cane is used by individuals who are either right handed or left handed. The base can be rotated so that it acclimatizes to either dominant hand. This feature also adds greater stability to the overall cane. Likewise, the quad cane can be easily adjusted to fit individuals who are either quite petite or bigger in stature. Furthermore, the Hugo Adjustable Cane is a good aluminum cane. This cane can be considered a little heavy for certain individuals. As such, those who experience some weakness in their arms may be unable to lift the cane all that well. This Nova Orthopedic grip cane consists of an aluminum shaft. It weighs about one pound and has a height adjustment from 29.5 inches to 38 inches. There are ten different height options. This cane has an orthopedic grip that has a large surface area. The Nova cane is able to support an external weight of up to about 300 pounds. This is definitely a good, sturdy can that can be leaned upon without hesitation. The main attraction of this cane, however, is the handle. It is perfect for those who have weak wrists or suffer from arthritis or carpal tunnel syndrome. Also, it has plenty of height options which means that people of varying heights will have no trouble using it. Unfortunately, this cane has been created to be suited for those who are right-handed and will not be easy to use for left-handed individuals. 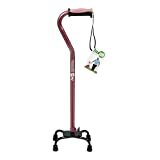 The Ez2care Quad cane is made from an aluminum alloy and it weighs about 1.35 pounds. It can be adjusted from 29 inches to 37 inches. The handle is an ergonomic one. The cane can easily switch sides as well as hands. This means that you can use it whether you rely on your left hand or right hand. The Ez2care cane can hold up to 250 pounds in weight. The cane can easily be folded up. The equally balanced tip ensures that the Ez2care cane offers a great deal of stability and balance to those struggling to walk. Another great element of this cane is that is one of the few quad canes that be folded up quite so easily. This helps to transport the cane more easily and store it as well. While the folding feature does exist, it can be quite difficult to fold and unfold the cane. Therefore, you may experience a little trouble when trying to store it. Whether you are looking for a walking cane either for you or a loved one, you cannot be too careful. It is a good idea to learn as much about this subject as you possibly can. This way, you can ensure that you will be making the right decision when it comes to choosing your walking cane. Hopefully, this article will provide you with most of what you might need to help you make the right choice.